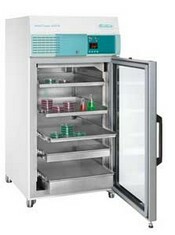 The new HettCube range of incubators brings cost savings and benefits the environment: HettCube incubators provide optimum conditions for the growth of cultures with an exceptionally low power consumption. The HettCube 200 and the HettCube 200 R, with cooling capability, both have a capacity of 150 litres. The HettCube 400 and the HettCube 400 R have a capacity of 310 litres. The HettCube 600 and HettCube 600 R have a capacity of 520 litres.